Juuou Mujin no Fafnir is an anime that places some emphasis on the ethereal entity known as memories. Memories aren’t facts learned or knowledge acquired; they’re events, precious happenings that we remember and look back on with glee. At least, the good ones. Because everyone has a couple of memories that really aren’t worth bringing back up. Imagine, then, if you had the capability to trade your memories for more power than you could ever dream of. Would you knowingly lose random memories to gain newfound strength? Or are they an invaluable part of your life that made you into the kind of person you are today? Fafnir doesn’t ask itself these questions. In fact, it should be forgotten as quickly as is humanly possible. Fafnir stars Mononobe Yuu, a boy who is the first male “D” – a person who has some connection to the Dragons that have popped up across the world. Attending an all-female academy designed to train “D” people and their powers, Mononobe works to protect the girls who have befriended him. It’s really hard to start anywhere with Fafnir, because it barely manages to do anything at all. Luckily (unluckily?) there is something worth investigating: Mononobe’s power. But that may be the incorrect way to describe it, for it isn’t technically his power. For some context, the anime follows the “monster-of-the-arc” formula, with each set of episodes aimed at eliminating a Dragon because they just have to. There isn’t a reason given for this; the Dragon’s just exist and the motivations behind defeating them are nothing more than having to do so in order to make sure nobody dies or, very awkwardly, causes the Dragon to “mate” with the person it’s seeking. The unexplainable nature of the show isn’t the worst part, though. It’s what Mononobe does to win every single fight that’s the most asinine. And this is enacting the most blatant “deus ex machina” possible. He calls upon some godly figure to provide him with some overly massive weapon to kill the enemy in one hit. It doesn’t make sense: there is no pretext for why he is given the opportunity to do this, having prolonged battles is pointless if he can just call upon this device, and he’s completely useless as a soldier if he never uses this ridiculous ability. The only caveat is that, in order to call upon it, he must relinquish memories that he owns. Which would seem to provide some outlet with which to explore, but Fafnir falters once more. It’s true that Mononobe, after each battle, seems to lose a memory or two – this really doesn’t start becoming apparent until much later in the series. But the problem is that, while this does happen, it doesn’t serve anything to the narrative whatsoever. In other words, his loss of cherished memories doesn’t affect anything that happens with the plot. It doesn’t tarnish his relationships both old and new; it doesn’t prevent him from using the same heavenly summon to vanquish his foes; and it isn’t even relevant thematically to what goes on within the anime. It’s only purpose is to make it seem “fair” in its usage. But Mononobe’s minimal characterization doesn’t allow the audience to “care” for his well-being so losing his memories means nothing. And the only important memory of his is one related to his sister. Meaning the show places very little focus on memories – despite it being a crux of the show – which in turn devalues the anime overall. Fafnir has some of the worst art and animation in its repertoire. It’s kind of amazing how bad the art can get within the show. And what’s sad is that there is little to no variety in the locations visited; everything is either a room with a bed, a few chairs, or the edge of the beach. So there is almost no reason for these separate areas to not contain as much detail as possible. Instead, the show presents each environment as entirely boring – it all starts to blend together the further it is watched. Worse than this are the Dragons. They’re entirely CG and equally horrid to see. The blocky textures, the unappealing color schemes, the way in which they heavily contrast with the already bland backgrounds; it’s quite difficult to witness them on-screen due to their general ugliness. But Fafnir’s biggest errors come in the form of inexcusable oversight. For example, characters will magically disappear during scenes, colors will be applied incorrectly, and even mistiming sound effects in accordance to whatever is occurring in the moment. It’s absolutely unwarranted for an anime to have such blatant grievances, especially when little attention is paid to everything else around it. The character designs aren’t even worth mentioning. The girls each wear the exact same outfit, with their only defining feature being their different colored hair – that is, when it’s colored correctly. Some have big eyes, some have large breasts, and Tear even has tiny horns to make her a bit cuter and dragon-like. Regardless of what is done to make them different, though, they all end up looking identical to one another in looks. As if it needs to be said at this point, but the anime’s actual animation is grossly below average. 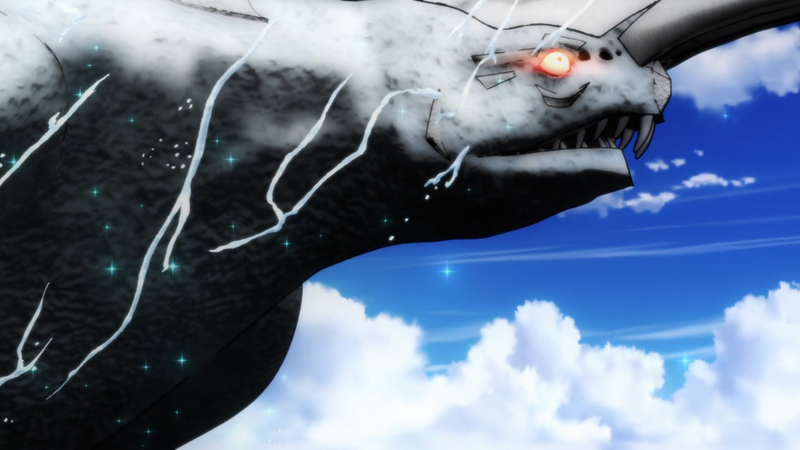 The combination of the Dragon’s terrible range of motion, reused ability sequences (most characters have mysteriously one move in his or her arsenal), and other rudimentary movements regarding facial expressions, special effects, and general actions make it clear that being an anime was an afterthought. 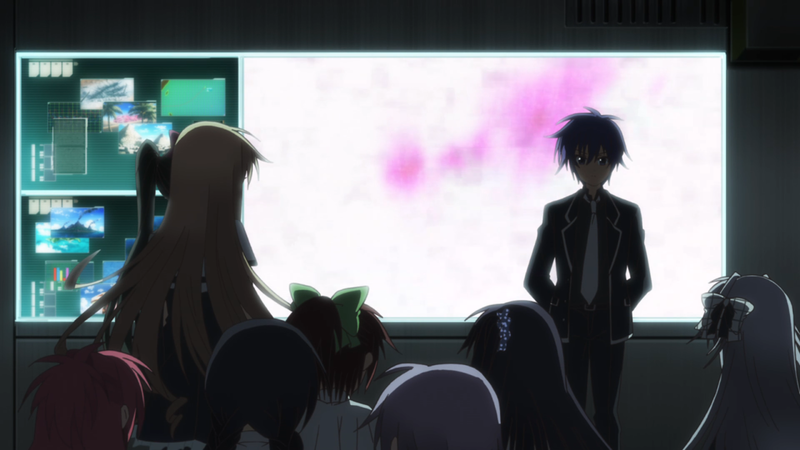 A glaring issue with the characters is in Fafnir being unable to provide any kind of attention to most of the cast involved with the narrative. 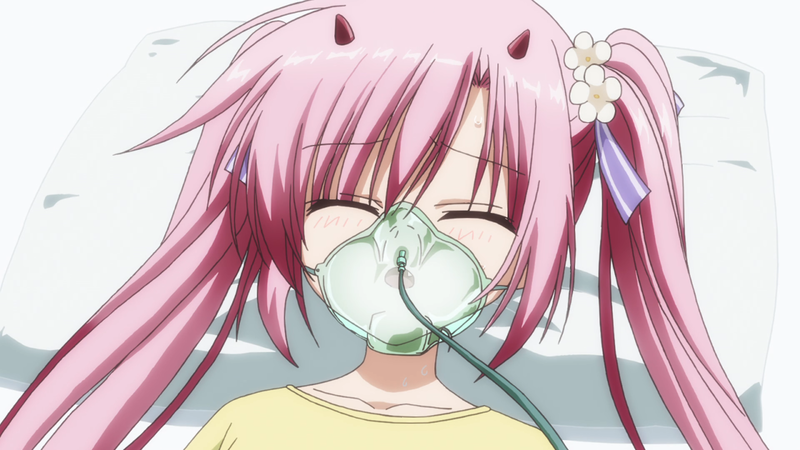 There are approximately seven characters that are “vital” to the happenings of the anime. However, three of them aren’t given a morsel of screen-time let alone an equal opportunity to be deemed worthwhile. Firill, one of these three, does manage to express her emotions once regarding her friends, but that’s the extent of her character. The other two use their abilities here and there and contribute nothing at all. Lisa has some semblance of characterization in her tense relationship with Mitsuki and her motherly one with Tear, but she, too, does nothing more than react to these other girls from time to time. As the ladder is slowly climbed, rung by rung, Mononobe is found next. Besides his amazingly unfair ability to gain power whenever he feels like it, he is given tiny references to his background. Having worked for a military-esque group known as NIFL, a lot of what he knows is loneliness surrounded by violence. This is a trait that many of the girls at the academy find themselves in as well, giving Mononobe the chance to connect with them on a more personal level. But these characteristics are minimal, and in fact, considering the amount of memory losing he undergoes, he in essence regresses as a character since what made him into the person he is today is essentially lost. Iris is one of the first people to connect with him because her past is somewhat similar – losing her parents to the Dragons, she found herself alone and afraid. She gains the courage to fight thanks to Mononobe’s protective ways, allowing the group to gain a member whose newfound strength is invaluable. Her character plateaus quite early, with her becoming nothing more than a cute voice for the majority of the anime. While the top of the ladder is never reached, there are at least a couple of semi-decent characters provided. 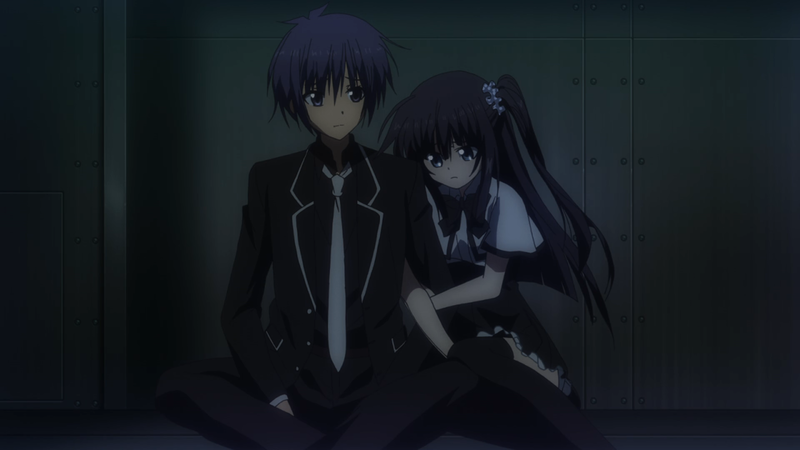 Mitsuki initially grew up with Mononobe. But when she was discovered to be a “D,” she was removed from society like the others and subsequently separated from her brother. There, she befriends many but during one cruel incident loses a close friend, forcing her mind to take on a more guilt-filled role. That is, she begins and even wants to accept all of the blame for anything that happens. Specifically, she tries to take the burden of eliminating those students who are themselves about to become Dragons so she doesn’t have to see those close to her succumb like her good friend did. This makes her distant and hard to work with, since she feels that all of the responsibility falls on her. When in fact, it falls on everyone. Tear’s arc helps her to realize this; that the people around her aren’t there because they have to be, they’re there because they’re her comrades and friends, who also don’t want to lose those close to them, Mitsuki included. Speaking of Tear, she receives about the same level of focus. Her past is mired in abuse, flames, and brainwashing, so her arrival at the academy shows just how delusional she is. Gradually, though, she acclimates not only to the society she never knew but also to the people who would become her mentors and family. While she relies heavily on Mononobe to make her understand that she alone has the power to choose where her life leads, she heeds his words and does something she’s never done before: make her own decisions. Tear’s character also helps to highlight something that the anime does with the Dragons themselves. There are a range of them, but Fafnir only showcases three: the White Leviathan, the Blue Hecatoncheir, and the Red Basilisk. The blue one doesn’t actively seek out any of the girls, and is there as a (huge) nuisance only. The other two, though, are symbolic of the characters they are after, namely Iris and Tear. The White Leviathan utilizes a “repulsion field.” Iris had, more or less, the same: she was isolated away due to her inept style of fighting. For Tear, the Red Basilisk was capable of seeing the future. And as we see for her, the future wasn’t as set in stone as it was made out to be. Tear’s future was altered – instead of becoming the Dragon she was always “destined” to become, Mononobe and the others gave her a much greater fate to follow. The opening theme takes on a rather “float-y” feel, being grander in scope than initially perceived. Perhaps due to all of the flying and fantasy elements that the show contains, it takes on this more romanticized stance. The ending theme is wholly generic, a poor piece with nothing going for it: not the singing, not the instruments, and certainly not the beat. The rest of the soundtrack follows this same trend. “Irisu Fureia” is slow and almost jazz-like in its presentation that doesn’t really fit with the anime’s overall mood or direction. “Hadaka de Dokkiri” is a fun song, with playful guitar and resounding trumpet, but once again, due to the “darker” atmosphere and more dramatic elements at play, it doesn’t necessarily have a place within the anime outside of a scene or two. “Midogaruzuorumu” is the only track that’s memorable; here the simple beat, combined with the ambient effects, is a tension builder that works in the show’s favor considering all of the tense moments it attempts to generate. The majority are like the first two, however, as nothing more than background filler. 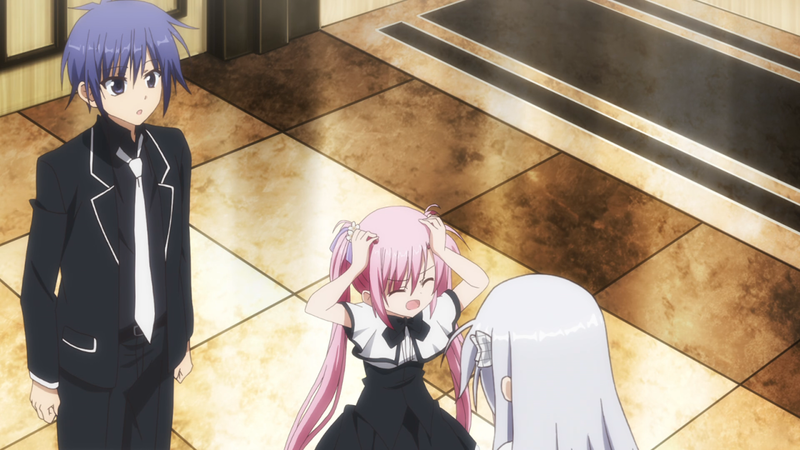 Voice-acting for Fafnir is about average. Special shout-outs are in order for Rina Hidaka as Iris for her quiet yet squeaky voice and Ayane Sakura as Tear for her childlike way of speaking. I wasn’t too fond of this one, but it was a little fun from the get-go. 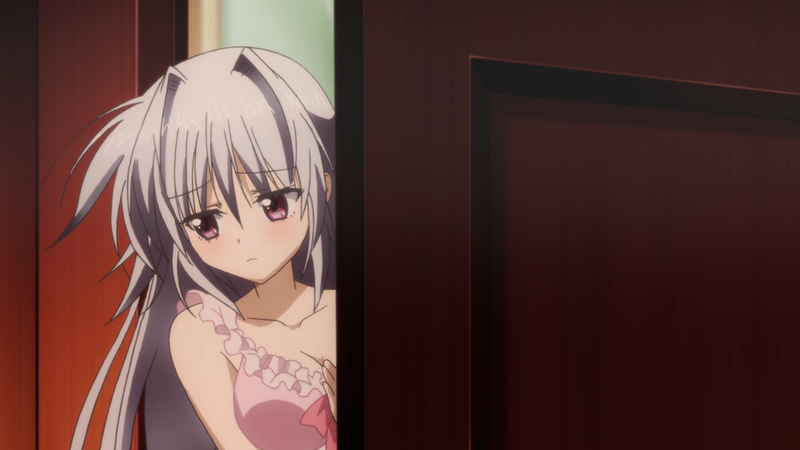 Iris is a cute character because of how sweet she is to Mononobe and everyone else, but she alone wasn’t always able to bring about smiles and laughs. When Tear came along – who likewise did her best to inject some entertainment into this stale show – it allowed Iris to have a bit of banter with her over their “boyfriend” and “husband.” In other words, some classic harem antics were had, which are always good for a chuckle time and again. But outside of Iris and Tear, the rest of the cast, either due to their incredibly lame characterizations, non-focus, or both, couldn’t do anything at all to inject some life into this one. And not just on an individual basis; their interactions between each other were very dull throughout much of the series. All of this says nothing of the boring fight scenes with hilariously bad animation, the particularly awful antagonist known as Kili, and the show’s inability to make anything even remotely worth investing in. There are a bunch of events that involve variables other than Iris and Tear, and when those were in the equation, the result was never good. Juuou Mujin no Fafnir is an anime with a nonsensical narrative, ridiculously poor characters, and awful art and animation problems that, in unison, create an unwieldy show with no sense of direction. This one shouldn’t just be forgotten; it should never have had the chance to be remembered in the first place.